These guys remind me of Moxy Fruvous (any other Moxy fans? you know you're out there) and a little of old school BNL. DO they speak the truth about the future of friends (not to be confused with Friends), Facebook and the internet? Who cares, it's a very entertaining vid. And I'm so not hooked. . . .much. When I was getting yesterday's post "play" ready I was sure I had already started putting some thoughts together but I couldn't find them. Today, after already posting the other post I did. Reading them over, I think I like this version of the post better but the other was already posted. So here, mostly just for myself, is the second edition of "play" which is really part 1 but...well you get the idea. Keri Smith, a professional illustrator originally from Toronto, believes that each and every one of us has art inside. We have creativity and beauty and passion but so often it gets all tangled up and stuck inside of us. We’re afraid to let it out because it’s messy. We can’t draw a perfect tree so we stop trying to draw trees altogether. We believe the lie that “it’s not very good” or “it’s not supposed to look like that”. Keri’s book is all about creating. Each page has a suggestion to take action. Rip this page up and paste it back in! Set this page on fire! Scribble madly. It’s not about creating fine art, it’s about creating and the great surprise is that some of these messes and mistakes turn out to be quite beautiful. We all need a little pixie dust before we can fly. Keri provides that spark of inspiration to put pen or paint or mud to paper. I have to go now. Time to play. 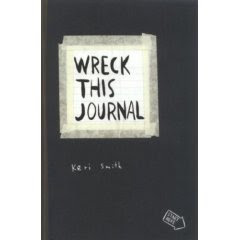 I bought myself a present the other day -- Keri Smith's latest book Wreck This Journal. If you're not familiar with Keri's work, I highly recommend her blog, The Wish Jar Journal (and in particular her list of How to be Miserable as an Artist). Keri makes her living as an illustrator but has put out two books now that are all about getting other people to get their art on. Wreck this Journal is the new one. The whole idea behind Wreck is that everyone has art inside them but it gets all tangled up in our idea of what art is "supposed" to look like. Forget art, this book dares, just create. The pages are mostly blank and filled with ideas on how to wreck the journal. Don't be afraid to hurt the book she warns. Don't be afraid of making mistakes, you can't make a mistake. Simply create. The pages suggest things like "cover this page in circles", "save your fruit stickers", "drip your coffee" and even "tie a string to the journal and drag it through the mud". Make a mark, any mark, she entreats and you just might find the beginning of a piece of art. 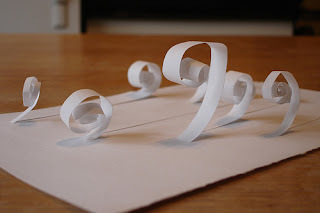 This came from the suggestion "cut the page into little strips and roll them into balls". Such a simple beginning, and a simple result, but an interesting one. Keri makes the bold assumption that art is fundamentally simple and essentially accessible to all and I love that. A couple of days ago I told a co-worker we were planning a brainstorming session and that everyone was invited. "Even the uncreative ones?" she asked. And it took me aback a little. I don't think there's such a thing as an uncreative person. It's not logical. God is incredibly creative and we're made in His image. Creativity isn't necessarily the creation of art; creativity is simply looking at one thing and imaging another way it could be. Creativity takes many forms, some of which are easier to recognize than others, but they are all creative. There is art and beauty inside each of us. Sometimes we just need a little help getting it out. We all need a little pixie dust before we can fly. Imagine being told that you couldn't go home. Where would you sleep if all your friends and family were in the same situation and the hospitals and shelters, even the hotels were no safer? Today is World Refugee Day and according to the UNHCR, almost 10 million people have had to answer this question. They are refugees of war, famine and disease. Tonight they will sleep in camps, in tents of plastic tarp and string. Some of them will sleep in ditches on the run. I'd be willing to bet that many of them have a hard time sleeping at all. Take a minute and think about where you'll lay your head tonight. If you're like me it will probably be somewhere soft and warm, somewhere dry and clean and dark and quiet. It probably even smells good. There's room to stretch out and if you're really lucky, someone to stretch out beside. Above all of this, it will be somewhere safe, inviolate. World Refugee Day isn't supposed to be a big downer but it is a day to take a wider look at the world. It's a day to think about the millions of people who have an almost inconcevable definition of "very little". Is it a day to be aware of what we have and be intentionally thankful for our own abundance. It's a day to look and see if there is just one little thing you can do, I can do, to ease the situation. I heard a representative from an aid organization speak last week. Someone asked him what it's like to see suffering over and over again. He said that it leaves you with two choices: harden your heart to it or allow your heart to be broken. Maybe the one little thing we can do today is to allow our hearts to be broken. We can think about all of these people and acknowledge that this planet is their inheritance as much it is mine. We can refuse to let them be the forgotten. For more information see the UN High Commisioner for Refugees. The last two weekends have been soggy and wet leaving me with a front lawn that looks about ready for harvesting. It's been driving me crazy, but you just can't mow a wet lawn. I checked the lawn Sunday, it was still wet but after a full 24 hours of sun on Monday things were all set. On a recent trip back east I got to spend some time in The Book Keeper, one of my all-time favorite bookstores. Many moons ago I had an English teacher who was always reading something from the New York Times' list. The Book Keeper kept a table at the front of the store stocked with books from that week's list. They, along with that English teacher, started me on a habit that continues to this day. I don't choose all my books from the list, but for the most part on any given day I've read at least something that's currently on the list. The Bookkeeper also keeps a well-stocked "We recommend" shelf and that's where I found Stephen Chbosky's novel The Perks of Being a Wallflower. According to Wikipedia, Perks is in its twentieth printing so admittedly I've come to the party late. But now that I'm here I'm not convinced I want to stay. Perks is all about being in high school. Chbosky has captured the utter confusion of the experience perfectly -- which makes for admirable art but somewhat uncomfortable reading. I found myself remembering, "o yes, I felt that way too" and then realizing that I was quite happy to have forgotten the feeling. Towards the end of the book the main character, Charlie, asks, "Just tell me how to be different in a way that makes sense." Isn't that exactly the heart-cry of so many high schoolers? The perk of being a wallflower seems to be Charlie's willingness to accept his different-ness without question. It is simply a fact about him as indisputable as his height or the color of his hair. Throughout the book people keep telling him to participate, but they miss that Charlie is participating, he's just doing so differently. He sees everything -- what is really going on and who is and is not who they claim to be. Action is always so highly valued but the advantage of being on the sidelines is that it gives you such a clear view of the room. This is not turning into a cat blog, however, I was finally able to get some decent shots of Flieeg and so I thought I'd post them. Cats, like small children, are notoriously hard to photograph (especially if you, like me, have a tendancy to forget to turn off the flash). It turns out that cats, also much like small children, are much easier to capture when they've only just woken up. So here is Gandalf in all her grey, striped glory. In the first shot she's snuggling up to my nice, clean laundry. Now if I could just get her to *do* my laundry that would really be something. Afterall, it's not like she pays rent. I was at Petsmart the other day grabbing some food for the fur-on-four-legs when I remembered that she had completely thrashed her collar. No problem, I thought, I'll just pick-up another. I headed over to the display and holy cats!! When did cat collars go all high-end on me? I had my choice of sparkly collars, collars with charms, licensed Harley Davidson collars, even a few plaids (one of which looked suspiciously like Burberry). Where were the plain, green collars? If you can believe it, the faux-rhinestone encrusted number pictured above was the plainest of the bunch. So G scored some bling. A first for her, and for me. So far she doesn't seem to mind the extra sparkle (but that bell was gone in less than 10 min). If she starts mewing for a cellphone or going all Paris Hilton on me I'm sure I can dig the old collar out of the trash.